Last week I travelled to Lincoln to meet with Dr Kye Chung Park. The reason for my visit was to learn some interesting electrophysiology techniques from Dr Park. He was clearly passionate about the work he does, as well as an excellent teacher. I thank him for his patience and generosity during my stay. I’m also grateful to Lee-Anne Manning for showing me around and answering questions during my stay. Dr Kye Chung Park welcomed me into his lab and taught me the basics of electrophysiology. Electrophysiology pertains to the flow of ions (ion current) in biological tissues and, in particular, to the electrical recording techniques that enable the measurement of this flow. Think of a hospital patient’s electrocardiogram (ECG). 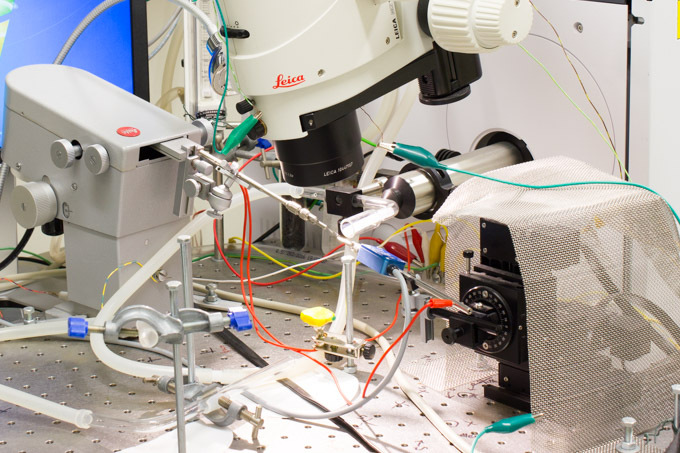 By placing electrodes on the skin, we can measure the electrical activity of the heart. This activity is shown by the peaks and troughs on the ECG. When I first saw the equipment I was understandably concerned. We can also measure the electrical activity inside the tissues of other species. 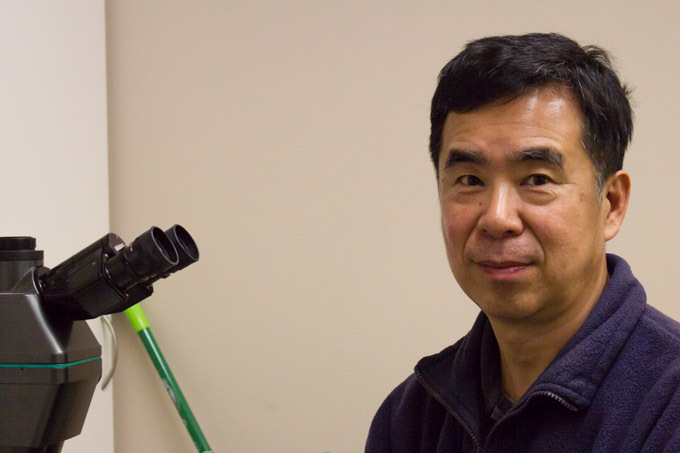 Dr Park showed me how to record the electrical activity inside a moth’s antenna. The antenna is snipped off the sedated moth, connected between two electrodes, and a puff of air is then passed over the antenna. This puff of air contains a single compound, or a mixture of compounds. 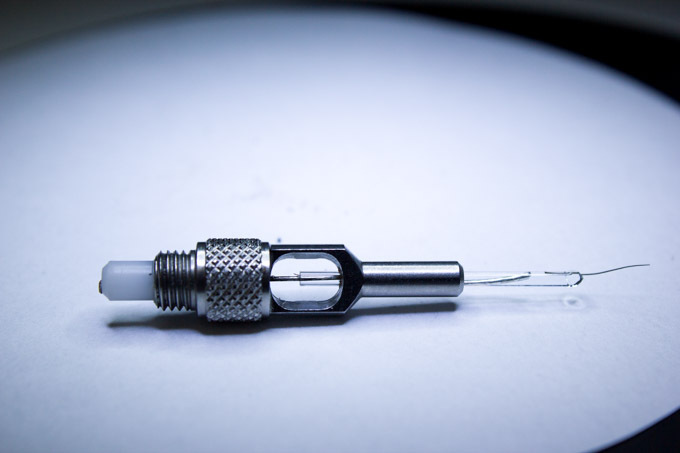 A single electrode. 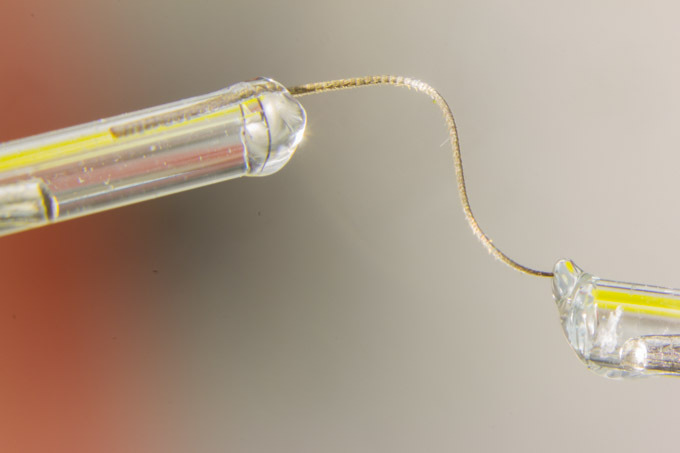 A thin glass tube filled with conductive gel forms a sheath around a silver wire. The moth antenna is embedded in the gel on the right. The antenna connected between both electrodes. A peak in electrical activity on the trace represents a nervous response to the compound or compounds inside the puff of air. This technique is called electroantennography, and the resulting chart of electrical activity is called an electroantennogram (EAG). Dr Park also showed me a technique called gas chromatography (GC). This technique is designed to separate compounds within a complex mixture. 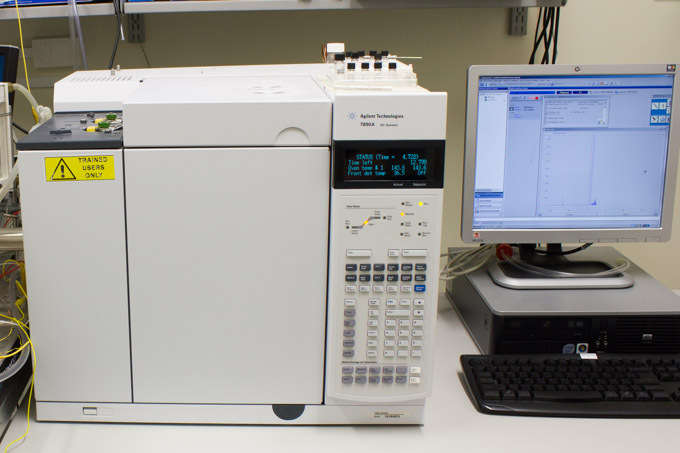 The gas chromatograph, or GC. A solution is injected into the GC machine and heated until it vaporises. The vapour passes through a narrow, coiled tube called the column, while being heated. Different compounds within the mixture react with the inner walls of the column, causing them to emerge from the column at different times. 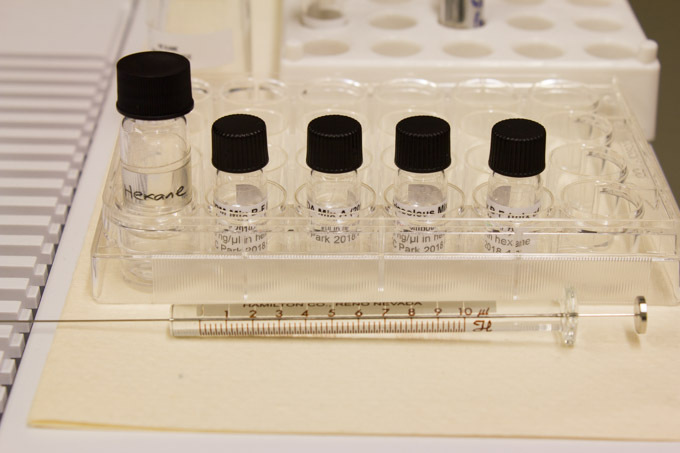 The compounds leave the column and pass through a detector. The detector in the GC machine we were using is called a flame ionisation detector (FID). Basically each compound passes through the FID and generates an electrical current as it is burnt up. This current shows up on a trace. 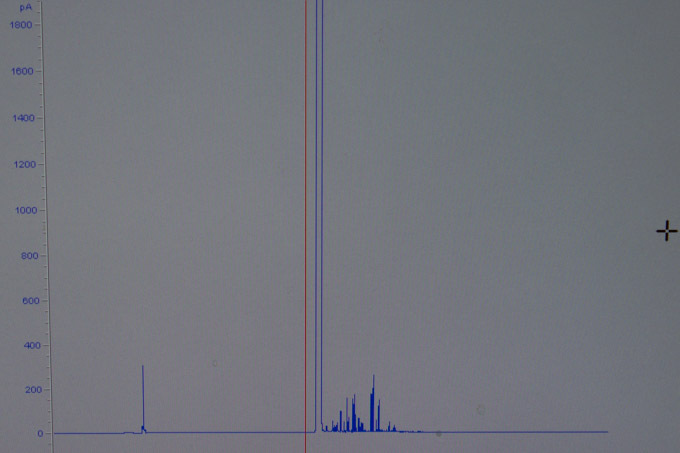 So if you have a mixture containing 20 compounds, during the course of the GC run you will see 20 peaks on your trace. Hexane is used as a solvent to suspend the compounds within. Only 10 microliters needs to be injected into the GC. Trace recording on the GC. Each peak is a different compound within the mixture. The red line indicates the start of the test. The really interesting part is when you combine the two techniques above. Instead of passing a puff of compound-containing air over the antenna, you can run the mixture through the GC. Each compound is separated in the GC. Half the flow of compounds goes through the detector as normal, but half is diverted over the antenna. 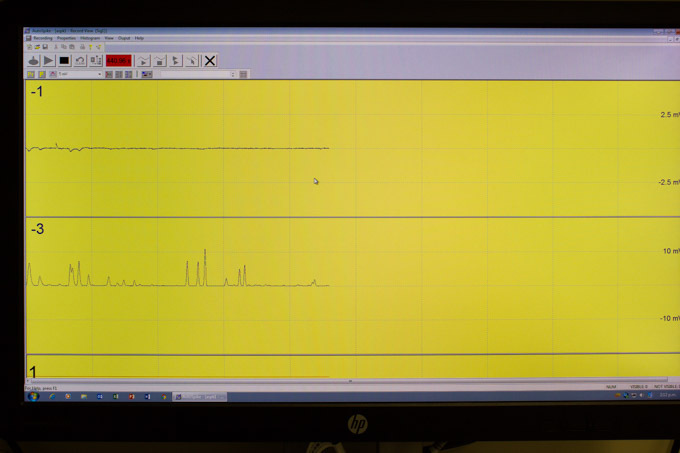 The electrical peaks from the compounds going through the detector are synchronised with the peaks caused by a response from the antenna. This means you can see what compounds are present within a mixture, and at the same time, record responses from the insect to individual compounds. The top trace represents responses from the antenna. The bottom line represents the compounds from the GC. The applications of this technology are vast. You could figure out what compounds are used by insects to attract each other, and then use these in ‘attract-and-kill’ traps. You could figure out what compounds repel certain pests and then spray these onto a crop instead of pesticides. As far as my PhD project is concerned, I could use these techniques to see if Trissolcus japonicus is attracted to any of the compounds released by non-target NZ stink bugs. Sounds like an interesting idea!